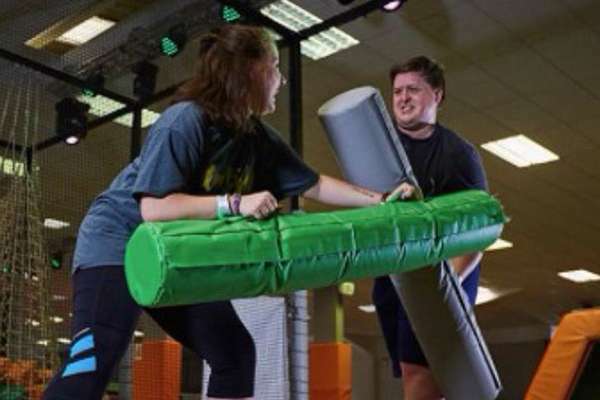 » Is a Trampoline Park a Good Date? 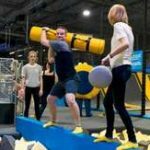 If you’ve been deliberating on where you want to take your sweetheart for your next — or perhaps even your first — date, taking them to a trampoline park may have crossed your mind. Well, if you ask us, a trampoline park date is exactly what any romance, old or new, needs! We love the idea of experiencing all of that youthful excitement on a date. So today, we’re going to talk a bit about what you can expect out of a date at a trampoline park. Better still, we’ll also talk about how to prepare for such a date: what to wear and what kinds of activities you can partake in. But first, let’s lay down the pros and cons! Should You Have a Date at a Trampoline Park? We know that we’ve already admitted to being biased. However, we should note that we’re completely aware of the possible drawbacks of having a trampoline date night. To begin with, you would have to consider your date’s likes and dislikes. What if they don’t find the idea particularly charming? On the other hand, they could just be a more low-energy person. Additionally, your partner might not appreciate being surprised with such a date, as they may not be dressed for the occasion. But then, these things can easily be cleared up with some conversation and a simple heads-up. In fact, we believe that the good outweighs the bad in this case. For one, taking your date to a trampoline park is original, to say the least. Trampoline parks have been around forever, but they haven’t really been seen as a great setting for a date. However, we believe that it’s an amazing venue for a romantic occasion of any kind. For example, we love the idea of having a trampoline first date. Isn’t that such a great way to get to know a person? Not to take things too fast, but we even love a good trampoline engagement. It’s the perfect story to tell your kids! We hope that was enough to convince you to jump onboard. So now, all we have to do is think of some awesome trampoline dates ideas, and you can be on your way. The best thing about having a date at a trampoline park is that a good time is practically guaranteed! Here are some of our favorite things to do during a trampoline date night. Naturally, we wouldn’t suggest a date at a trampoline park if we didn’t want to have some fun. So obviously, the first thing we recommend doing is simply playing with your partner. There’s nothing that can spark a relationship better than being playful, and this would be the perfect place to do it. If you decide to go to a proper trampoline park, you’ll likely find that it’s brimming with fun things to do. There might be a foam cube pool on site or even one that’s directly underneath a rock climbing wall. There may also be dodgeball and basketball areas. Doesn’t that sound like the most energizing and fun date already? Once you get to the actual trampolines, you can both show off your skills a bit. Try to make each other laugh by pulling funny poses mid-air. You can start a competition with other patrons of the trampoline park. Who cares that they’re not interested in that kind of a thing? Make sure that you out-jump them anyway! Trust us, this is much more romantic than it seems. After you’ve shown off your trampoline mastery, encourage your partner to try out your daredevil trampoline moves. There’s nothing more romantic than managing to do a full body flip on a trampoline through a joint effort. Imagine the triumph and the delicious adrenaline spike! Now, this last tip isn’t strictly one of our trampoline date ideas, but rather a tip for making the most of your date. Make sure that you completely let go and enjoy the experience. Allow your heart to jump between your throat and your stomach. Laugh and be without a care in the world. In fact, leave the world at the door. This space is meant to be a special getaway for you and the person you’re with. So cherish the moment! After you leave the trampoline park, you can use those carefree feelings to talk about some of your favorite childhood memories too. That’s exactly why having a trampoline first date is so tempting! What Do You Wear on a Trampoline Date? Before you schedule the trampoline date night, there’s one last thing to discuss. What do you wear on a trampoline date? Can you wear jeans at a trampoline park? Let’s see. Overall, we suggest wearing comfortable athletic clothes. We recommend wearing bottoms that have a drawstring at the waist so that they stay on during strenuous exercise. Ladies will also want to prepare by wearing a supportive sports bra. That’s a big part of the reason why we wouldn’t recommend surprising your lady friend with a trampoline date. Wearing a regular bra on a date at a trampoline park simply isn’t an option for most girls. However, if you want the date to be a surprise anyway, tell your girlfriend to wear clothes that won’t slip off during exercise. On the other hand, if you’re looking to take your boyfriend to a trampoline park, you can tell him the same thing. Everyone should also keep in mind that most trampoline parks will have you take off your shoes and leave your socks on. So you should warn your partner to bring shoes that are easy to take off. And that’s about it! This has been our complete guide to having the most amazing trampoline first date — or any date, for that matter. We certainly hope these things will come in handy for you and that special someone. Good luck!